The four chicks have been growing fast and are starting to get their feathers making them look like punk-rock teenagers. They were banded on May 20, about 24 days after hatching. 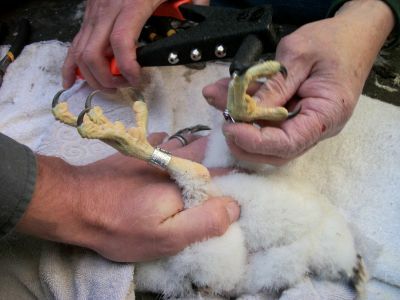 Banding was done by two biologists from the Michigan Department of Natural Resources (DNR), Mark Mills and Nik Kalejs. Banding is scheduled between 20 and 25 days of age, so that the chicks are not too small and fragile, but not too big and feisty. Rebecca, however, got an Academy Award for her performance as a protective and feisty mother! Last year, Rebecca was not happy about the banding and stood over the banders and screamed at them. This year, she upped her game and dive-bombed the banders hitting their hard hats. She also tore off the burlap, placed over the front of the box to keep the young chicks from jumping out the front as the banders reach into the back of the box. She, of course, also vocalized her opinion about the banding process and the banders. The biologists determined that there were two males and two females and that they appeared healthy and well cared for. Be sure to watch the banding action in the video clips in the Video Archive.